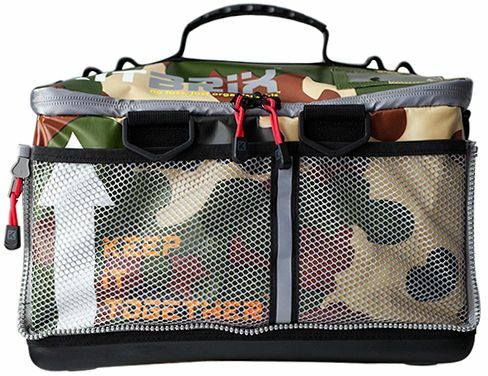 KitBrix bikers duffle bag in jungle camo color are tough and durable, used best in training or on sports day. It is the only kit organization system that encourages you to ‘train as you fight’, keeping your kit together, ensuring you are ready. Interchangeable icons on the end plate of bag enable easy kit recognition for all sports. Essential for any athlete, family or sports team, maximize training time, reduce storage and organizational pain of everyday kit organization and transfer. Details: Join bags together with connecting zips. Interchangeable bespoke icon pocket. Double lined, military grade tarpaulin. Raised, robust base for bag integrity. Easy reach, webbed outer pockets. Interchangeable strap with clip. Lockable zip. ID recognition pouch. Military style grab handle. Reflective stripes.